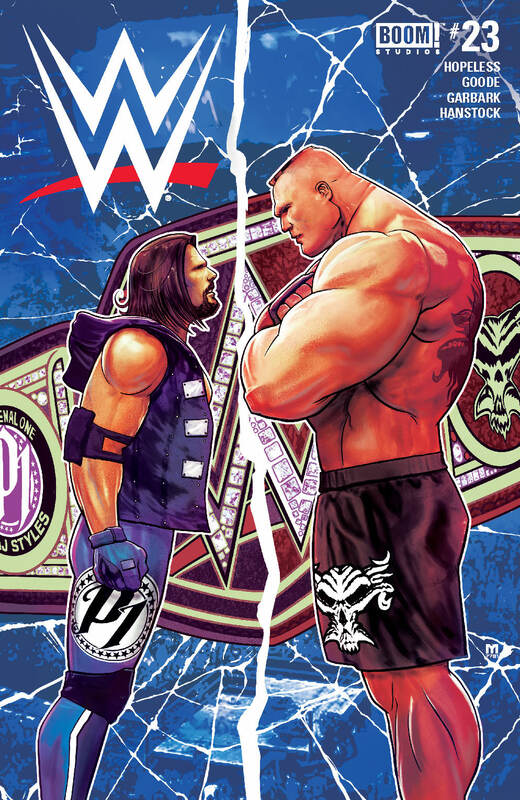 WWE #23 Review – AiPT! With a healthy bit of backstage kayfabe, Dennis Hopeless has once again proven himself to be the most talented writer WWE doesn’t know it has. For the majority of their feud in 2016, WWE Superstars John Cena and AJ Styles went back and forth over who was the true “face that runs the place.” With a full year straight as WWE Champion and high profile matches at every stage provided, AJ has made his case well. BOOM! Studios seems to have already decided that AJ is the way forward for their WWE comics. This month’s cover feature and main story surrounds the story of Styles against the Beast, Brock Lesnar, at Survivor Series 2017. With a healthy bit of backstage kayfabe, Dennis Hopeless has once again proven himself to be the most talented writer WWE doesn’t know it has. For a bit of IRL backstory, WWE’s Survivor Series pay-per-view is one of its “big four” events. In recent years, the event’s theme has been brand vs brand, champion vs champion. In 2017, then WWE champion Jinder Mahal was on his way to facing Raw’s Universal champion, Brock Lesnar. Two weeks before the event, SmackDown Live ran in Manchester, England, where AJ Styles, often considered one of the top grapplers in the world, challenged Mahal, defeating him for the title and the dubious honor of facing Lesnar. WWE billed this sudden change as a “dream match,” selling the brawl as the proverbial David vs Goliath’s larger, meaner brother. WWE #23 takes a deeper dive into both the backstage interactions leading to Styles’ win and the personal (fictional) backstory that made the smaller man stand up and fight against the behemoth Lesnar. Being bullied as a child by a larger neighbor but insisting on standing up for himself and what was right led Styles to lifelong insight and pride in his fighting ability. Even though he lost his fight against the bully, he gained respect in himself. Despite Lesnar telling Styles to take his beating and lay down, AJ kept fighting to the last. It’s no spoiler that the WWE Champion lost that “exhibition” match just over a year ago. What was missing from the seemingly thrown together bout was this deep backstory that just never had time to be told on the air. Part of the advantage Hopeless has is the time and focus he can give to characterizations and backstory that 5+ hours of live television each week never could. Or, at least, doesn’t. Perhaps the main roster could phone Hopeless every so often to see how to create depth of backstory. The B-tale of the month (“B-tale, B-tale, go, go, go!”) is a quick retelling of the NXT career of La Sombra, El Idolo, Andrade “Cien” Almas and his manager, Zelina Vega. As NXT has shown over the past 4+ years, they have the time and ability to tell significantly more stories with their characters. NXT turned Almas’ rejection by fans into an amazing heel run and that was captured very well by writer Bill Hanstock and artist Kendall Goode. While it wasn’t as funny or newly creative as B-stories have been in the past, it brings Almas back into the spotlight, and that is always tranquilo. Why can't we incorporate this kind of story into mainstream WWE? No funny kayfabe 80s comics this time around. I miss Macho Man being chased by Ultimate Warrior.